BKV Group is excited to announce the addition of retired Fire Chief Greg Martin as our firm’s Public Safety Specialist. Martin will add valuable experience to our team of BKV public safety experts in working with police and fire departments around the country. His understanding of operations, budgets and systems will further our team’s ability to support our clients’ goals in evaluating and identifying the unique requirements for each department. Martin will also help the BKV government team with marketing, planning and managing public safety projects. With more than 36 years of experience, Martin has been well exposed to all aspects of the fire service. Martin started his career in 1982 as a firefighter/EMT at the Vancouver, WA Fire Department. Since then he has been with five fire departments across the country. 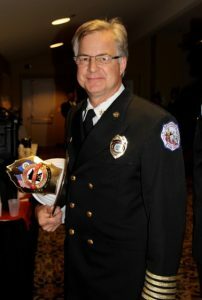 Prior to joining BKV Group, Martin spent 22 of his 36 years as a Fire Chief. These include ten years as the Fire Chief of the Rochester, MN Fire Department, two years as Fire Chief of the Sioux City, IA Fire Department, and ten years as the Fire Chief / Emergency Management Director for the Lansing, MI Fire Department. Martin graduated in 1988 from the National Fire Academy’s Executive Fire Officer program, holds the Chief Fire Officer designation (CFOD) from the Commission on Fire Accreditation International and is a graduate of the Rocky Mountain Leadership program. Throughout his years in the fire service, he completed various courses in fire suppression tactics, investigation, budgeting, incident command and fire ground management. In addition, he holds a B.A. from the University of Montana in Education and a M.S. from Lewis and Clark University (Portland, OR) in Psychology. Martin is adept at budget and capital planning, operations and staffing, project management, labor relations and policy development. Throughout his career, he has been involved in the planning and implementation of 10 fire station remodels or new facilities in Minnesota, Michigan and Washington. Before his retirement, Martin worked with BKV Group on the design of Rochester Fire Station No. 2, an award-winning new facility completed in 2015.